For the past several years when John Stinger is not painting beautiful landscapes, John sells monthly cartoons to a variety of magazines and publications that serve the growing vintage, antiques, art and collectibles market segment- an area where he has considerable expertise as a collector and dealer for over thirty years. He calls the cartoons, “Stinger’s Collecting Classics” © and will feature one a month on his web site for the fun and entertainment of his clients and visitors, who usually stop by to see his latest landscape paintings. 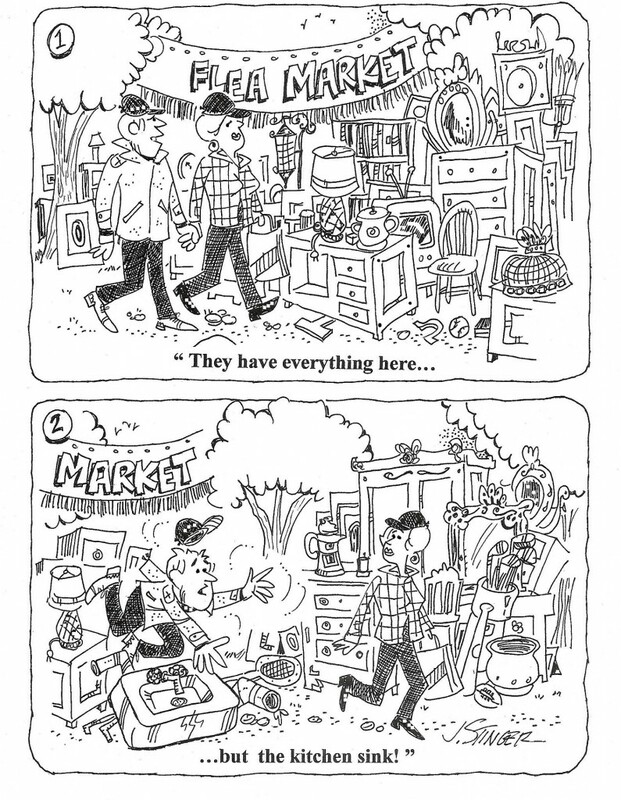 Brimfield Flea Market Humor By J. Stinger Details: “Collecting Classics” © by John Stinger is a monthly single panel gag cartoon that appears in a number of national and regional publications serving the antiques, vintage and collectibles markets. Source: Each Stinger cartoon is written and produced by him based upon his 40 years of experience as a nationally syndicated cartoonist, corporate communications executive, antique dealer, art collector and book author. Brimfield Flea Market Humor By J. Stinger “Collecting Classics” © by John Stinger or for individual hand signed framed prints of any cartoon, please call for pricing. Browse our website http://brimfieldantiquefleamarket.com/ for more cartoons and lots of information about visiting the Brimfield Flea Markets in May 2016. Search our blogs and FAQs to plan your next trip to Brimfield. See you there!